Sounds like a good idea, so why don’t we recommend them? Runflat tyres have been a long term gripe since their release into the BMW world, even making an appearance on BBC’s Watchdog for causing cracked alloy wheels. The reason BMW has fitted runflat tyres to their later range of vehicles is to save on production costs (they no longer have to supply and fit a spare wheel, wheel brace, jack etc). A runflat tyre can be effective against a small or slow puncture to allow you to get to a tyre centre, however they can still ‘blow out’ like a conventional tyre. 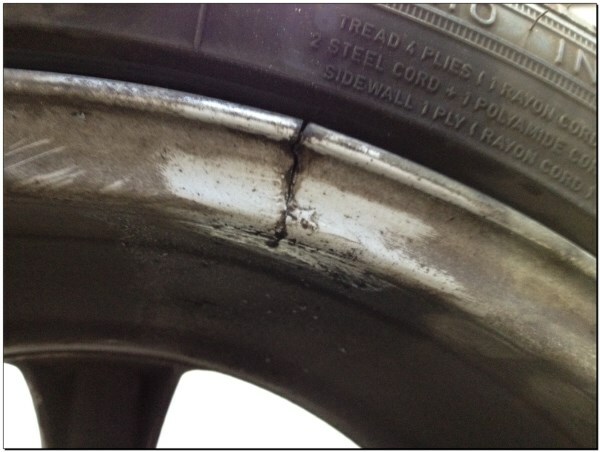 Alloy wheels fitted with runflats are susceptible to cracking. This is due to the sidewall of the tyre being so hard (to support the vehicle in the event of a flat tyre) all of the shock energy from potholes, bumps etc is transferred into the wheel causing a fracture. Not one BMW ///M vehicle has ever had runflat tyres fitted from the factory due to their poor handling characteristics, instead these vehicles are equipped from BMW with a temporary tyre repair kit. We recommend taking this same approach with a standard vehicle. On average, run flat tyres cost around one third more than regular tyres, severely reduced ride quality, crack alloy wheels, go out of shape. All for providing the customer with ‘some’ peace of mind. The bad does really outweigh the good. The below video show a F10 wheel being span up. As you can see the alloy wheel is quite deformed. We do however advise removal of runflats at your next tyre change and select a branded set of conventional tyre. There is no need to change all four tyres at the same time, It is perfectly safe to change to non-runflats in pairs (as long as you have matching tyres/systems on the same axle). Conventional branded tyres are lower in cost and provide a much better ride quality. The wheel photoed below was removed from a BMW F10, as you can see the wheel is quite heavily buckled. 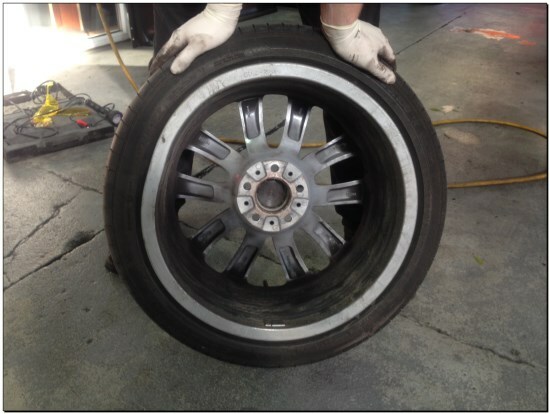 Sadly the wheel pictured below has suffered heavier damage, the wheel has actually cracked in two places. 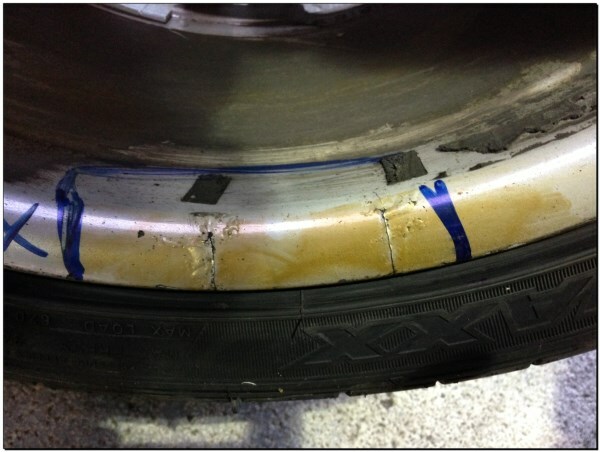 Two cracks in the same same alloy wheel, all could have been avoided by removing the runflat tyres. Tyres can and do go out of shape. 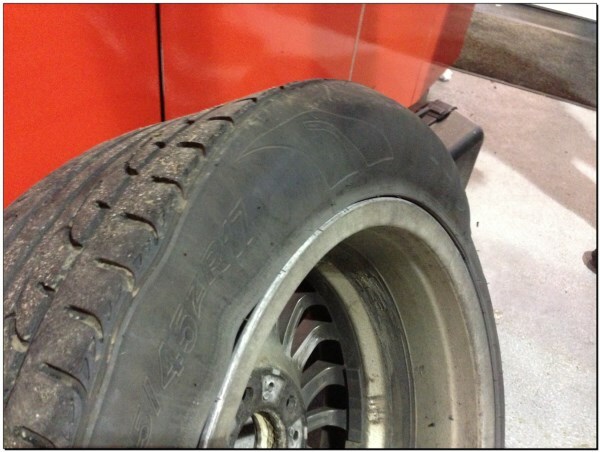 Looking at the tyre pictured above, our customer complained of a ‘slight judder’. BMW sell a M-Mobility kit for £97.50 + VAT (we can also supply you with this kit). We can however supply you with an aftermarket tyre repair kit which contains everything the BMW kit contains for £34.95 + VAT. Please speak to one of our friendly staff if you are making this change and require a tyre repair kit. Costs less, rides nicer, no split alloy wheels, simple tyre repair kit… Get off those Runflats!